By George, it's a royal birthday! By George, it’s a royal birthday! 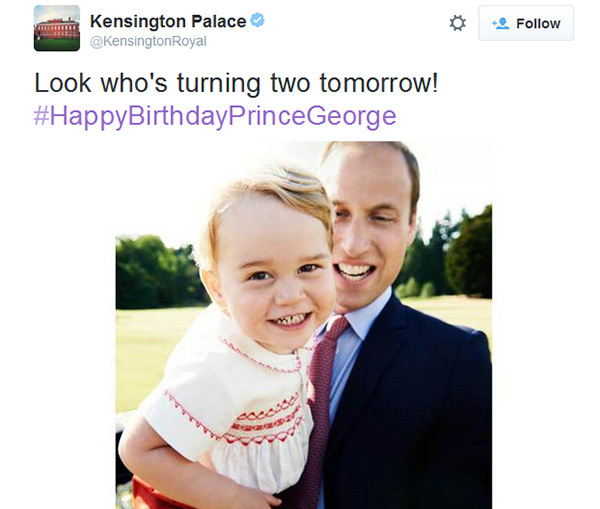 The world’s most adored Prince turned two this week. Happy birthday Prince George! The adorable little prince with the world’s most pinchworthy cheeks celebrated his second birthday yesterday and if the Grenadier Guards playing the Happy Birthday tune during the Guard Change is any indication, we’re sure Prince George was as spoiled as he should be for the day! Word from Kensington Palace is that the Duchess of Cambridge is throwing a low key party for George this weekend at their family home, Amner Hall, celebrating with family and friends. Event planning being a Middleton family specialty, Kate’s no fuss party will no doubt be exceptional, possibly with a game of pass the parcel thrown in for good measure. It’s been a busy year to date for this little guy. Prince George became a big brother when he and his parents welcomed Princess Charlotte. As far as we can tell from the official photos, he’s the doting and curious kind of toddler sibling as we see him peeking in his sister’s pram at her christening earlier this month. From all of us here at Babyology HQ, happy birthday to you, darling George! And Kate, if you’re reading, do feel free to contact us for a Show us your party! post.